Flexible To Light Fires — Not You Are You Breathing Solder Fumes? Dorcy has the 3AAA K2 on sale for $35 before shipping, which is annoying since I just laid down $40 at Craftsman for it. Better yet, Amazon stocks it for $25, also before shipping. Serves me right for getting it out of the package before I got home. 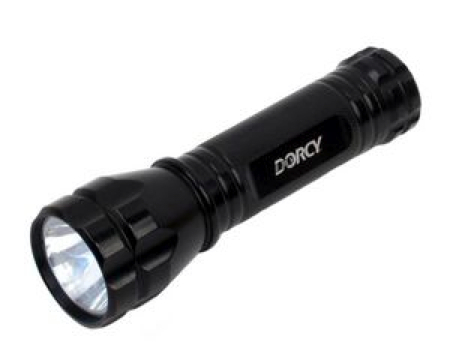 At $25, this one strikes me as a no-brainer if you need a light. And, if the K2 isn’t quite up your strasse, Dorcy makes a huge variety of intensities and sizes. I have been using Coast light for a few years now. Great battery life, blind you bright and Lowes carries them. I have 3 of them! I’ve got one of those. It’s so bright it’s not even funny. Think poor-man’s surefire. I use the Coast LED lenser daily, and I am amazed at how long a single AA will last in such a bright light. The 3 LEDs are plenty for working under appliances. I own enough of these little lights (kind of a fetish) to know that all LED bulbs are not created equal. This light is as bright as some with 9 bulbs. I recently found a local lumber yard was closing out their stock of Coast products, and they had the 2 AA version for $25. I had forgotten about that until this post, & hope they still have one! Poor man’s surefire is right, I’ve seen them both in action and there’s not any difference! This flashlight is LED-based, so its battery life ought to be a lot better than any incandescent-based flashlight. I don’t have personal experience with this or any of the Surefires, but I’d imagine the LED-based Surefire lights have comparable battery life. I use a Surefire with the lithium cells and a 60 lumen LED. Bright as heck, and it also has semi-sharp crenelations around the lens for self protection use – hard to choose between that and the 6 D-cell Maglite for checking out that middle-of-the-night noise. The batteries last forever, and it just feels “right”. But darn expensive! That looks and sounds just like the Dorcy lights I’ve been paying $10 for at Big Lots. They’ve got an AA Dorcy like this there for $10, too. Though I was planning to pick up the 2 AA Led Lenser, today I found a comparable light made by Great Neck tools(or at least imported by them). Called the Great Lite, it was $10.00 at the local Sears parts store. Came with a nice leather loop-style sheath. Seems sturdy as any Maglite I’ve seen. Thanks to these comments I picked up 3 of these Dorcy lights at Big Lots for $10 each. I also picked up a Coast LED lenser v2 tactical at Lowes for $25. All nice lights for the money!